We have L1 location minutes away from shops, bars, restaurants and public transport links, making it the perfect choice for visitors, students and working professionals in the heart of Liverpool. Each room has a flat-screen TV and each floor has two shared kitchens and bathrooms, all regularly cleaned and maintained by our onsite team. 2.5% for credit card payments. Reception: Monday - Friday 9-5, out of hours instructions are given for check ins outside these times. I used Arena a house for a one night stay for a social night out in Liverpool. Received my email for check in, with the door key code.. 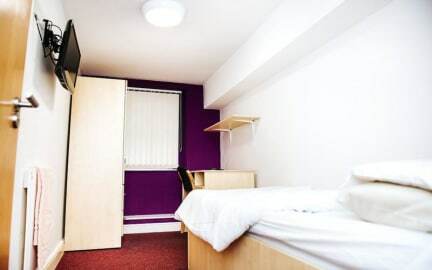 The room is small, like student accommodation, but I expected that, and liked the fact that it was a private single room and not in a dormitory like many hostels. The room was clean, the shared bathroom was a little tired, but nice and clean, and everything worked just as it should. The lounge and kitchens looked clean and well equipped. I would recommend. 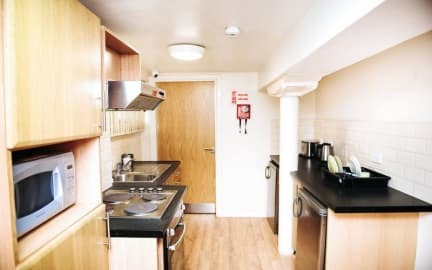 Great clean basic accommodation near town centre where you can stay for £17 per night and park your car outside the door for £5 what more can i say and Liverpool is just the dogs for a night out good times!! After looking at the reviews on HostelWorld before booking, I wasn't sure what to expect. Having stayed at the property, I don't understand where all of that hate comes from. I stayed in a basement room. It was no-frills, but clean, warm, secure and quiet. With CCTV throughout the building, I felt safe and reassured. Staff were friendly and responsive. The only downside was that the mattress in my room was obviously worn and tired, with prominent springs. Great location, but no real communal place to meet other travelers. I like hostels to meet people. However, its fairly quiet. My bed killed my back and the laundry facility is pretty bad. I basically wasted a whole day trying to do laundry. Great place to get your head down for a weekend spent on the tiles. Remember the lock code for the bathroom kitchen though, you will appreciate that at 7am busting and dehydrated. Room was spot on, bathroom wasn’t exactly nice, secure enough and quiet enough. Location is brilliant right near Liverpool One. Felt like student accommodation. Rooms were spacious, beds comfortable enough. Bathrooms were quite frankly disgusting unfortunately. Not clean at all and no hot water. Apart from that, the location was ideal and we enjoyed our stay. It was ok for the money but there were a few issues with my room (but not enough to complain really). Pros: The location is good and right next to the local night life, but that means it is noisy. I expected this though. Cons: There was popcorn down the side of the bed, the window wouldn't stay closed and the mattress was terrible. The lock on one of the bathroom doors near the entrance is broken. But it was cheap and no worse than I expected. I'd only stay again if I really had to. Duty place and power facilities.